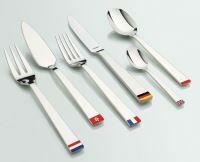 At Amefa, we know all about flatware and kitchen knives. After all, we've been setting tables all over the world since 1931! So what's the secret to our success? With strong heritage and expertise we know what works, whether you're setting your first table or your thousandth! Founded in 1931, Amefa’s heritage has been built on both retail and hospitality customers and we have become one of the best known brands in these industries. Still a family owned business with a young and energetic team, the Amefa group continues to grow and evolve in response to the rapidly changing demands of the industry. Our mission is to be a valued, reliable partner providing the benefits of a global company with the speed, flexibility and personal touch of a local company. With our leading brands Amefa and Richardson Sheffield, we offer a wide range of flatware and kitchen products, with designs to suit every style and occasion. The Amefa Group has 7 subsidiaries in the USA, the Netherlands, Germany, France, United Kingdom, Poland and Hong Kong which export to different countries worldwide both to hospitality and retail customers. All our products are subject to rigorous quality control. Amefa is also committed to improving working conditions in our global supply chain, we therefore are member of the BSCI (Business Social Compliance Initiative). In 2017 our 7th subsidiary opened in the USA. From our office in Ossipee we serve both retail and catering customers. Whether you're active in the hotel branche, own a restaurant or are active in retail, we're happy to help and advise you. We're the experts when it comes to flatware and kitchen knives. After all, we've been setting tables all over the world for over 85 years now!